Updated Thursday March 28, 2019 by Greenbelt Registrar. Congratulations to our 6u and 14u 2018 County Flag Champions!!! Late March - Early July. Mouthpieces are required for practice and games. Your child must also possess an MVA-issued identification card for ALL games. This program will be offered at $90 per player. This fee includes player membership/insurance and a customized dri-fit uniform. Games start April 28th (no games Memorial Day weekend but game WILL be played on Mother's Day and Father's Day- weather permitting). There will be a 6-game season regular season, in which all games will be scheduled for Sundays, including post-season play for eligible teams. Weekday games may be required for make-up games. Players must be 4-14 years of age as of January 1st. Registration closes on May 3, 2019; however, all teams will be capped at 15 players so register early to reserve your spot. Coaches and team mom are always needed so please consider signing up! Our 6U Flag Football division is offered every spring children who are league ages 5 and 6 years old (age as of January 1st of that year). The 6U age group is our first introduction to flag football. The focus is learning the basic fundamentals of football (throwing, catching, running), while also learning game play. Teams will play on a 120 yard x 53.3 yard field and use a Wilson K2 or Pee Wee size football. The 6U age group will generally practice twice a week prior to the start of game and keep their practice slot once games begin. Practices will be held during the week and on weekends (if needed). Teams will play 1 to 2 games per week (usually on Sunday but weeknights are possible) and will typically last for 6 weeks (not including playoffs). There will be a referee on the field in addition to 1 coach during game play. Participants can expect practices to be held in the Greenbelt area with games being hosted at a few select fields within Prince Georges County. Our 8U Flag Football division is offered every spring to children who are league ages 7 and 8 years old (age as of January 1st of that year). The 8U age group is more competitive than the 6U age group, but the focus is still on skill progression and fundamentals. Teams will play on a 120 yard x 53.3 yard field and use a Wilson K2 size football. The 8U age group will generally practice twice a week prior to the start of game season and keep their practice slot once games begin. Practices will be held during the week and on weekends (if needed). Teams will play 1 to 2 games per week (usually on Sunday but weeknights are possible) and will typically last for 6 weeks (not including playoffs). There will be a referee on the field during game play. Participants can expect practices to be held in the Greenbelt area with games being hosted at a few select fields within Prince Georges County. 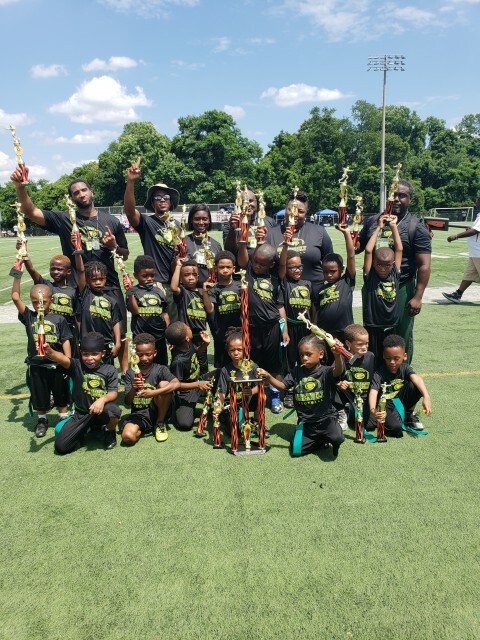 Our 10U Flag Football division is offered every spring to children who are league ages 9 and 10 years old (age as of January 1st of that year). The 10U age group is our next level of competition for flag football. Teams will play on a 120 yard x 53.3 yard field and use a Wilson K2 size football. The 10U age group will generally practice twice a week prior to the start of game season and keep their practice slot once games begin. Practices will be held during the week and on weekends (if needed). Teams will play 1 to 2 games per week (usually on Sunday but weeknights are possible) and will typically last for 6 weeks (not including playoffs). There will be a referee on the field during game play. Participants can expect practices to be held in the Greenbelt area with games being hosted at a few select fields within Prince Georges County. Our 12U Flag Football division is offered every spring to children who are league ages 11 and 12 years old (age as of September 1st of that school year). The 12U age group is our next level of competition for flag football. Teams will play on a 120 yard x 53.3 yard field and use a Wilson TDJ size football. The 12U age group will generally practice twice a week prior to the start of game season and keep their practice slot once games begin. Practices will be held during the week and on weekends (if needed). Teams will play 1 to 2 games per week (usually on Sunday but weeknights are possible) and will typically last for 6 weeks (not including playoffs). There will be a referee on the field during game play. Participants can expect practices to be held in the Greenbelt area with games being hosted at a few select fields within Prince Georges County. Our 12U Flag Football division is offered every spring to children who are league ages 13 and 14 years old (age as of September 1st of that school year). The 14U age group is our highest level of competition for flag football. Teams will play on a 120 yard x 53.3 yard field and use a Wilson TDY size football. The 6U age group will generally practice twice a week prior to the start of game season and keep their practice slot once games begin. Practices will be held during the week and on weekends (if needed). Teams will play 1 to 2 games per week (usually on Sunday but weeknights are possible) and will typically last for 6 weeks (not including playoffs). There will be a referee on the field during game play. Participants can expect practices to be held in the Greenbelt area with games being hosted at a few select fields within Prince Georges County.